Starting, Tuesday, May 29, through Thursday, May 31, crews will change access for north to south travel on Sheyenne Street under the Interstate 94 (I-94) bridges for three nights between 8 p.m. – 6 a.m. During the overnight work, Sheyenne Street will be closed to all traffic underneath the I-94 bridges. By the morning rush hour, both directions of Sheyenne Street lanes will reopen and current work zone traffic patterns will resume. To complete the needed bridge demolition, The Sheyenne Street closures will give crews additional working room and ensure safety for the motorists while the start the demolition of the westbound bridge. While the roadway is closed, crews will also install the five large storm sewer pipes that need to go across Sheyenne Street to connect to the system. Contractors planned this work during hours that will impact the fewest drivers as possible. 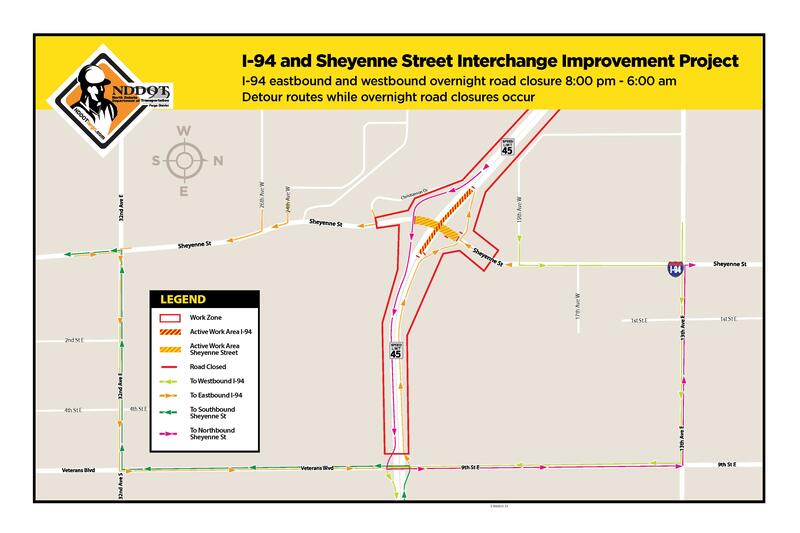 Motorists need to be mindful of the westbound Sheyenne Street exit from I-94 has changed. After the 9th Street E/Veterans Blvd bridge, motorists need to stay in the right lane to continue straight for a half mile on the west side in order to exit onto Sheyenne Street. Motorists looking to remain westbound need to be in the left-lane to cross over to the head-to-head traffic. Northbound and southbound traffic are using the same ramp to exit. At the bottom of the ramp, motorists can go left to travel south and right to travel north on Sheyenne Street from the northeast ramp. The northwest Sheyenne Street exit loop ramp is now closed to drivers. Eastbound and westbound I-94 traffic is being carried head-to-head in one lane in each direction for about 1 mile surrounding the Sheyenne Street interchange. Interstate traffic will remain in this driving pattern until the first year of work enters into winter suspension in late fall. Speeds on I-94 will be reduced to 45 mph on the interstate and 25 mph on the interstate ramps. Crews are beginning the demolition of the westbound bridge, working on storm sewer improvements, new lift station and digging to install the new retaining wall. Travel under the I-94 bridges will be temporarily detoured and reopened by the early morning commute for three nights.